Fluance introduces its first budget turntables | What Hi-Fi? The Fluance RT80 and RT81 (pictured) are designed to deliver a “pure analogue listening experience” by incorporating high-quality materials, but sell at an affordable price. Both decks are belt-driven and have an automatic speed change between 33 1/3 and 45rpm, but are supplied with different cartridges. The Fluance RT80 comes with Audio Technica’s AT91 while the Fluance RT81 is supplied with the Audio Technica AT95E. Both attach to a balanced aluminium S-shaped tonearm which, says Fluance, “coupled with its advanced anti-skating system, caresses each record to conserve and protect a user’s vinyl collection”. Other differences include a felt slip mat on the RT80 and a rubber one on the RT81, but both models have been made using Fluance’s proprietary “audiophile-grade” MDF for the plinth with built-in isolation feet and an aluminium platter. Fluance says the materials help to reduce interference to leave you with a “pure stereophonic sound”. The RT80 features a lightweight, hollow plinth while the RT81 has a solid one to help reduce interference further. Fluance has also fitted a Texas Instruments preamp and gold plated RCA line outputs. You can pre-order either the Fluance RT80 in piano black or the Fluance RT81 in walnut from Kickstarter now for $180 and $230 respectively, with shipping expected from May 2016. 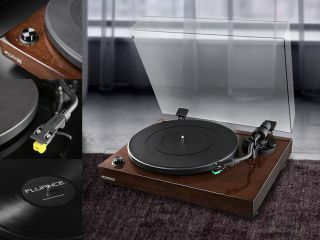 Fluance has confirmed the turntables will ship to the UK, with prices expected to be around £141 and £177 respectively. Fluance is a relatively new name to us here at What Hi-Fi? with the only other products we've reported on being the affordable XL5F floorstanding speakers, designed for home cinema use.